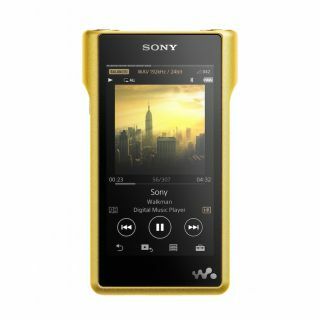 Sony's new NW-WM1Z is a €3300 gold-plated Walkman | What Hi-Fi? Sony has launched a rather special range of hi-fi kit at IFA 2016. Dubbed the Signature Series, this high-end line of hi-fi components features a number of products designed not only to showcase Sony's engineering prowess, but to work together as a group (all the products used in the range feature the newly standardised 4.4mm balanced connection). The most eye-catching element of this new range is the WM1 series of Walkmans, including the quite bonkers NW-WM1Z. Machined out of a solid, oxygen-free copper ingot and gold-plated for added sound benefits, the WM1Z is a seriously blingy hi-res audio player. Inside, the player features special braided cable, running from the amp to the headphone jack, which has been designed with the help of hi-fi cable specialists Kimber. This golden child's sibling is the NW-WM1A. It's a more affordable €1200 and is made from a solid block of aluminium. It uses normal oxygen-free copper wiring inside and different type of resistor. The capacity of the 'A' is 128GB compared to 256GB in the 'Z'. The Walkmans do share a revamped user interface and Bluetooth connectivity, but there's no wi-fi connectivity. The handcrafted MDR-Z1Rs are closed and ported over-ear headphones, complete with 70mm drivers, sheepskin leather earpads and a Fibonacci-patterned grille design. Each pair comes with balanced and unbalanced headphone cables and is packaged in its own special presentation case. Last, but by no means least, is the TA-ZH1ES, a €2000 headphone amplifier complete with built-in DAC. The ZH1ES features a specially strengthened chassis and acoustically tuned top panel to help control unwanted vibrations. The amp is compatible with hi-res audio, including DSD 22.4MHz and 32-bit/768kHz PCM files. It boasts a wide variety of digital inputs including coaxial, optical and USB, while outputs include balanced 4.4mm and XLR sockets in addition to a standard 3.5mm socket. The Sony WM1 Walkmans and MDR-ZR1 headphones are due to go on sale in October, with the TA-ZH1ES to follow in November.